In hindsight I can see clearly how nonchalant she wanted to seem, playing with the gold locket and dropping it inside her sweater, glancing in the direction of the window as if a pretty bird had alighted there. They say a writing partnership is like a marriage. In the case of Anne Rothman-Hicks and Ken Hicks, it *is* a marriage. They starting writing together while dating in college and they never looked back. If you’d like to keep track of their many projects, you can go to their website or find their author page on Facebook. Also, I want to give props to their publishers: the Jane Larson series is published by Melange Books, and you can find children and tween books at Muse It Up Publishing. As always, if you’d rather read than listen, a transcript is below. Enjoy! Laura Brennan: It is my great pleasure today to have not one, but two guests: the writing team of Ken Hicks and Anne Rothman-Hicks. Ken and Anne have to date written over 20 books, from children’s books to mysteries. Ken and Anne, thank you so much for joining me. Ken Hicks: Thank you for having us. Anne Rothman-Hicks: Thank you very much. LB: So let’s talk a little bit about you. You are not just a writing partnership, you’re an everything partnership. KH: We do a lot of different projects, including photography and jewelry and stone sculpture and that kind of thing. KH: And were married. That’s an ongoing project. LB: So how did you meet? ARH: We met at a college dance. KH: Anne was at Bryn Mawr College, and I was at Haverford College in Pennsylvania. They’re very close and I think were even closer at the time. And we met, and the next year we had a writing project together. LB: That’s fantastic. Now did one of you start writing first and draw the other one in, or was this from the beginning something you wanted to do together? ARH: We were both writing individually but joined up together. LB: So were you writing the same type of things or were you each writing in a different genre? ARH: I was writing poetry for a while. KH: Yes, she wrote very nice poetry. But I think what happened was, when we first met, we were both interested in children’s books. I was reading a lot of children’s books of the time and Anne had her own knowledge of them. In fact, she was doing a Latin translation of Winnie the Pooh. We decided we’d like to try to do a student project together and talked to a professor at Haverford and he agreed to do it, so that’s what we did. We spent a semester writing a children’s book. LB: That is so neat. So that was the first book you are together and then you’ve written several other children’s books together. Was that really your first love in terms of books? ARH: I think it was just shorter, so it seemed less of a daunting challenge. KH: Yes. After the book we wrote in college, the next book we wrote together was a novel, and really we were working on novels for a long time. It was really after our children were born that we got back to writing children’s books. ARH: After they were born and after they were grown, really. KH: Well, some of them started when our daughter, I remember when our daughter was in grade school and she would like to read the chapters as they were finished and I would walk her to school in the morning and we talk about them. She’s a very smart girl. She’s been very helpful to us. LB: Oh, that’s great. So you are raising your own editors. KH: We try to pay her but she won’t take money. LB: That’s even better. I like that even better. So then, what drew you to mysteries? KH: Well, it’s a genre that we enjoy. I’ve always liked Agatha Christie and the fact that she fools me every time. And it seemed to allow us to deal with characters in a way that we find interesting, and have interesting characters. And also give the reader something they like. I mean, readers like mysteries. ARH: And also it had some structure that you didn’t have to just create yourself. There are certain expectations with a mystery. KH: Some of the books we write are straddling the line between mystery and thriller. So, again, I think what we try to do is find a story we want to write and then it finds a genre, rather than going, okay, let’s try to do this and work at it that way. LB: So are you talking about the Jane Larson series when you say it straddles the line between mystery and thriller? LB: No, I absolutely agree. KH: Weave, I think, is the most “mystery” of them all, but I think has sort of a thriller aspect as well. You know, we always try to work in some sort of romance as well. ARH: Praise Diana and Mind Me, Milady have more thriller as well as mystery. LB: Right. 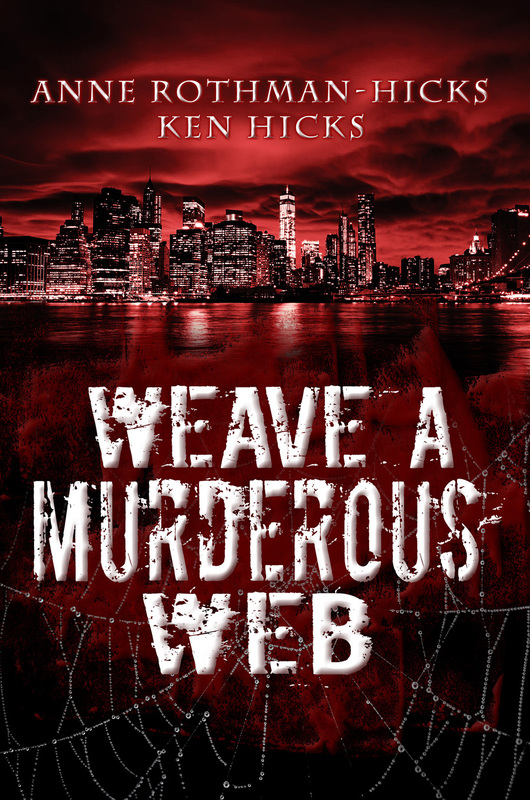 And then Weave a Murderous Web is the one in the middle that has more mystery elements. ARH: Yes. We also wrote a mainstream that is not a mystery, called Kate and the Kid. It was pretty successful, I think, as a book. KH: Yes, that was — it involved a young woman just starting out New York, so she had some similarities to the Jane character. KH: Younger and not quite as hard-edged as Jane is. You know, Jane’s been around a little bit longer. It’s one of our favorite books. LB: So where did that fall in the scheme of things? Did you write that before you started the Jane Larson series? Before Praise Her, Praise Diana? ARH: They were just all written and rewritten, all kind of — you know, we’d drop one and take up another. Finish one and take up another. So it’s kind of hard to say really. KH: Yes, Anne’s absolutely right. We tend to start a book, finish it, maybe be unhappy with it, put it aside, come back to it. A lot of these books have evolved over time. ARH: Kate developed really slowly. It was probably the slowest one of all. KH: It’s a mainstream and they’re very difficult to market. LB: I’d love to talk about your writing process. How does that actually work? Does one of you come up with the idea for it? How does your process work? ARH: We both come up with the idea usually and we talk about it a lot. One person usually hand writes a draft and I work on that, then he works on that, that I work on it, like that. You know, back and forth. KH: Yes, and really what we want to happen. But we don’t have a strict outline. I do a lot of the inputting on the computer but it’s a process whereby at the end we have something we both really like. LB: So you really have a distinct voice that is the voice of the two of you writing together. ARH: In all the books, in the children’s books, in the mainstream book, in the mysteries. Yes. KH: A different voice, yes, that’s correct. At this point, if I’m writing something, I know how Anne’s going to react to some things. So it tempers the way I might approach it. And makes me more aware, also. And if she doesn’t like something, she lets me know. We just go back and forth. ARH: And if he doesn’t like something, he certainly lets me know. KH: [Laughter.] You know, it’s funny because we both, I’m sure we’re thinking about exactly the same moment. And we’ve had a lot of good times going over this stuff. And some arguments too. But we work it out. It’s a marriage. LB: That’s awesome. So let’s talk a little bit about the Jane Larson series. So first of all, she’s an attorney so it’s set in the world of the law and her law firm. KH: That’s correct. Law plays a part in all three of those books. LB: Was one of you a lawyer? KH: Yes. I mean, I still am to a limited extent. So the law part, we don’t have to research that because I know that. But each one of the three books — you know, Jane has this life were she’s a lawyer and in all three books, things are happening in her life and things are happening in the law, in the cases that she picks up, sometimes all of the same time. LB: One of the things that I really enjoy in the series is how — the relationships that you have developed. Jane deals with a lot of other different people and how she deals with them depends a little bit on their hierarchy within her law firm but also within the justice system itself. There’s a lot of very complex relationships going on. KH: I’m glad that you enjoy that. I mean, that is certainly true. She has to talk to the judge one way, an opponent on a case another way, a client a different way. ARH: A boyfriend another way. A friend another way, sure. KH: And the press. People have said that you feel like you’re in New York City when you read our books. LB: Well, it gives a real sense of the world, yes. KH: Everybody interacts in their own way. And they interact differently with different people. LB: It gives the sense of the legal world in a really in-depth, intricate kind of way. I mean there’s nothing, it is not Perry Mason, that is not what your book is. But I’ve always loved those scenes setin the courtroom because it gave me a sense of the law and this does that as well, not necessarily in the courtroom but in all the ways in which the law interacts with her investigation or the crime, or just her daily problems. Was that something that you really wanted to do, was setting it in the world of law really important to you? ARH: Sure, otherwise we wouldn’t have done it. KH: It also gives as you say a framework in which were comfortable. Bear in mind, Anne’s father was a lawyer so she knows a little bit about this stuff as well just from hearing her father talk around the dinner table. So it’s an area where we are comfortable, and it gives a structure, and it gives actual reasons why people can do or can’t do what they do. ARH: And ways to bring people together. KH: Yes, and ways to bring people together. LB: That’s always a problem sometimes with a mystery series, is that you don’t want to have the Cabot Cove syndrome where, bless her heart, Jessica Fletcher is doom. When she walks in the room, someone’s going to die. LB: So I want to talk about the series. So far there are three books in the Jane Larson series. I thought you did something really interesting. The first one and the third, the most recent one — so Praise Her, Praise Diana, which came first, and then Mind Me, Milady, which is the most recent — are both told in the third person. But then in the middle, the middle book you had Jane tell her story in the first person. KH: The books came out, were published in the order that you’re describing. But the chronology of the books is really different. In Weave, Jane is the youngest she is in any of three books. Mind Me, Milady is the second chronologically and Praise Her, Praise Diana is third chronologically. The reason we did the books the way we did, was really — you know, Praise Her, Praise Diana and Mind Me, Milady were really both very complex books in terms of plot and characters. ARH: And they sort of have books within the books. And that I think lends itself better, at least when we’re doing it, to third person. Whereas the first, Weave, the first as we conceived them, is first person. It’s the simplest, really, with its plot. KH: You know, Praise Her, Praise Diana is another very difficult book. It deals with a woman who was raped, and we deal with abuse in a lot of different ways to a lot of different people. And it’s a big book. It’s another one of our favorite books, just because we feel like it really says something important. You know, has a message that really we wish more people could read. Actually, we’re working on another one right now that we believe is going to be, well, it’s first person so far. 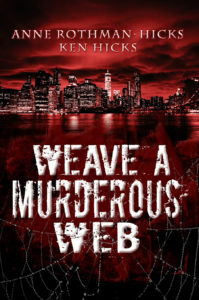 LB: You also mentioned that Weave a Murderous Web was the more mystery, as opposed to thriller, of the three books. Is that what determines the voice, or is there something in the way you’re conceiving the story for this newest book? ARH: I think Weave and the newest book are going to share that they have a certain cynical sense of humor, and that is best conveyed in first person. LB: And I love Jane’s cynical sense of humor, by the way. ARH: The plot runs differently. KH: Yes. The plot runs differently and the disclosure of details runs differently. LB: So you mentioned that you’re often working on multiple projects, putting one aside and going to the other. So I know you’re working on the next Jane Larson book, which is awesome; what else is next for you? KH: We wrote a book for, it’s really a tween book. It’s not really Young Adult, but it’s certainly more than middle reader. It’s called Things Are Not What They Seem. There’s this talking pigeon, who is a man who’s been turned into a pigeon 200 years ago, or 150 years ago, in England. Anyway, we wrote that book and now we’ve done a sequel, we’re working on a sequel that we hope will be coming out maybe early next year. KH: Well, Things Are Not What They Seem, the thing we try to do with Things Are Not What They Seem is to create an atmosphere that was really very real, but in which strange things happened. In other words, this guy, this pigeon, is a guy who was turned into a pigeon and he talks — but otherwise, he’s a pigeon. He flies, he can’t open a newspaper, he gets very frustrated. He loves to eat. So it is a fantasy, and it is an adventure in New York City. But the second book, the sequel, we’re going to use the same characters and have them go back in time, also involving this pigeon, to the time of the Revolutionary War. There was the Battle of Manhattan in New York City and we incorporated that into the book. So that’s something different for us, but we enjoyed it very much. LB: What do you think each of you brings in terms of a strength to the writing partnership? Is one of you better at dialogue, research…? What are your particular strengths? ARH: Well, Ken is obviously better at dialogue. He writes most of it. And I’m better at images and character description and description between the dialogue. LB: Oh my gosh, that’s like a perfect fit. LB: So if someone is looking for you and looking for your books, where can they find you online? KH: Well, they can find our three Jane Larsons through Melange Books. KH: We’re on Amazon. And all of our books, our children’s books, are published through Muse It Up Publishers. They’re also available on their website and through Amazon. And we have a Facebook page as well where we post information about books, reviews and that sort of thing, from time to time. And a website. LB: Terrific. I will link to all of those things in the show notes. Thank you so much, Anne and Ken, for joining me today. KH: Thank you for having us. ARH: Thank you very much, Laura. Excellent interview with excellent authors.